It’s my first dupes post! 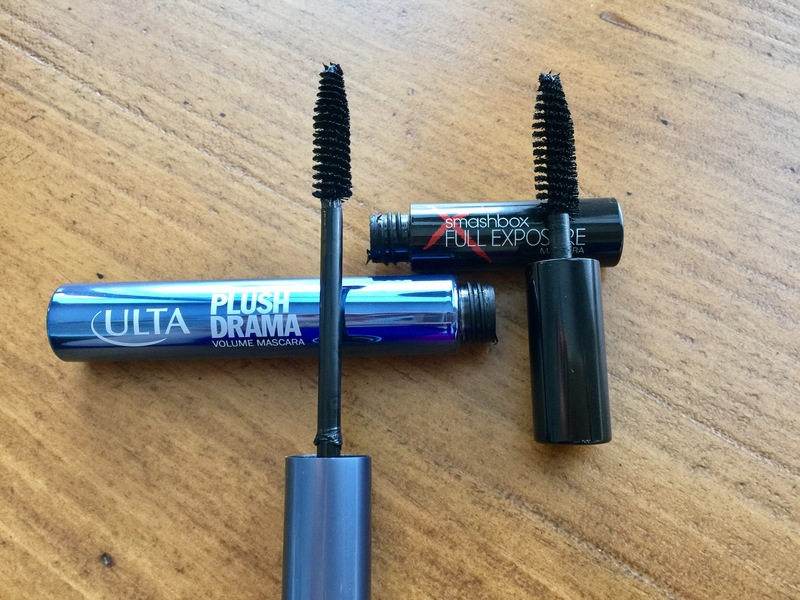 I’ve been testing a lot of mascaras for the past month, and this dupe became so obvious so quickly: The Ulta Plush Drama mascara is a near-perfect dupe for the Smashbox Full Exposure mascara. 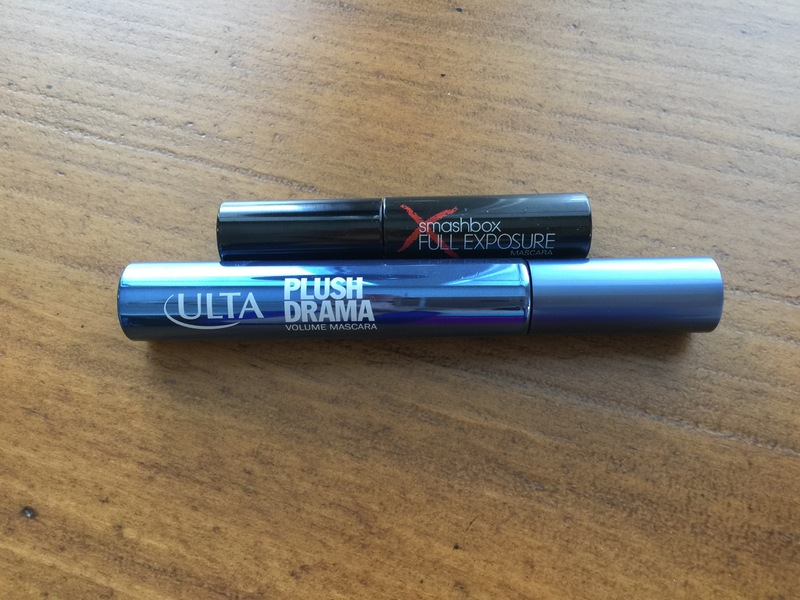 And to be honest–spoiler alert–I actually prefer the Ulta mascara just a bit more. I want my makeup to work, and I want to love using it. And I love drugstore makeup. So it really bothers me when people talk about dupes in terms of budget only, as if the only reason anyone would want an affordable option is if they could not afford high end. High end isn’t always better, and choosing drugstore isn’t always about money. So while I will do dupes posts from time to time, it’s because I think we should all know what is available, what performs similarly, and then make choices based on any criteria that matter to us, from budget to packaging to brand loyalty to plain old personal preference. With that said, let’s get into the mascaras. As you can see, both have very large wands which are similar in shape–quite long (both are the nearly the size of my actual eye), full at the wand end, and tapered at the tip. There is significant space between the bristles–this is not a really dense brush.The Smashbox bristles are slightly closer together. Both look like they might be a little clumpy due to the brush construction (this turns out to be only a minor issue). But if you are someone who likes really tiny wands and brushes, like you’d find on the Cover Girl Super Sizer mascara or the Maybelline Lash Discovery mascara, you’re probably not going to like either of these. There is a slight difference in the formulas: The Ulta formula is slightly wetter than the Smashbox, which has a thicker formula. I do think the Ulta mascara needs a few days to dry out a bit after you open it–there is a significant difference between the first and second week of use. For me, the wetter formula of the Ulta mascara, combined with the brush shape, means that I get volume in my lashes and the mascara is easy to work with if it becomes clumpy. The Smashbox, on the other hard, can be more difficult to work with since clumps are less easily broken up since the mascara dries down quickly. I also feel like I have to build the Smashbox up more to get the same effect. Again, wet v. dry mascara formulas is one of those true personal preference things–it’s about what you’re comfortable working with. But the final look is the same–long, volumized, and fanned-out lashes. I have both in the shade Jet Black. (That’s right–exactly the same shade name.) Neither flakes or smudges on me, though I do have dry skin and eyelids so this is rarely a problem with any mascara. I do prefer to curl my lashes before using either. If I try to use either mascara without curling my lashes, the width of the brush means that it tends to transfer onto the lid as I drag it upward. This does not happen when my lashes are pre-curled. A final reason I prefer the Ulta mascara: It stays feeling soft and plush even hours after you’ve put it on, so if you apply makeup in the morning before work and need to reapply mascara before an even in the evening, for example, you can easily do that and it doesn’t become dry, spidery, or clumpy, the way many mascaras do. Overall, these are both great mascaras, if you like the large brush shape and size. They add volume, build nicely, and widen your eyes by adding length as well. Both do clump a little, but again, it is not a huge problem and I think it actually adds to the volumized effect. Let me know in the comments if you’ve tried either and what you think of them!